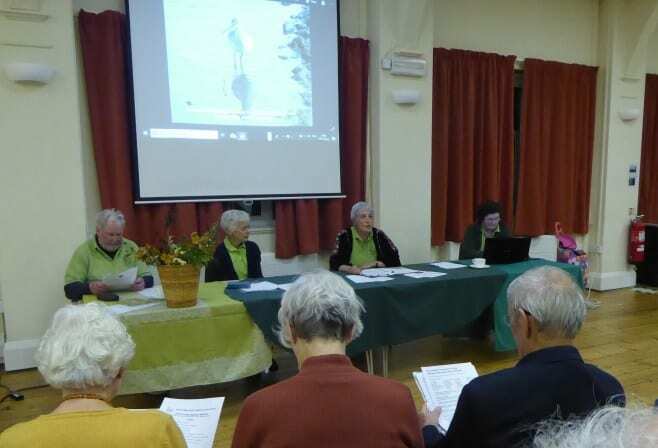 The Brook Meadow Annual General Meeting was held on Friday November 9th 2018 at 7pm in the St James Church Hall in Church Path, Emsworth. 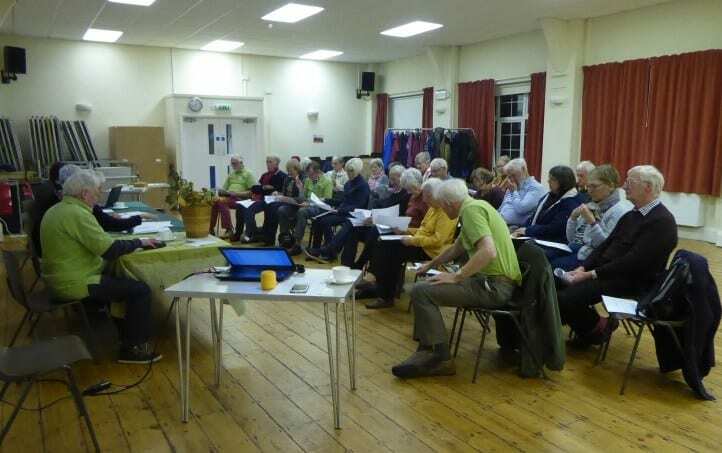 There was an audience of 28 including all committee members on a wet and blustery evening. 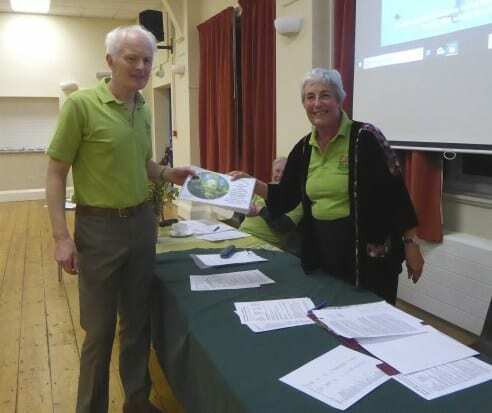 A presentation “Wildlife on the Meadow this year” given by Brian Fellows. General discussion on the future management and membership of the Conservation Group. 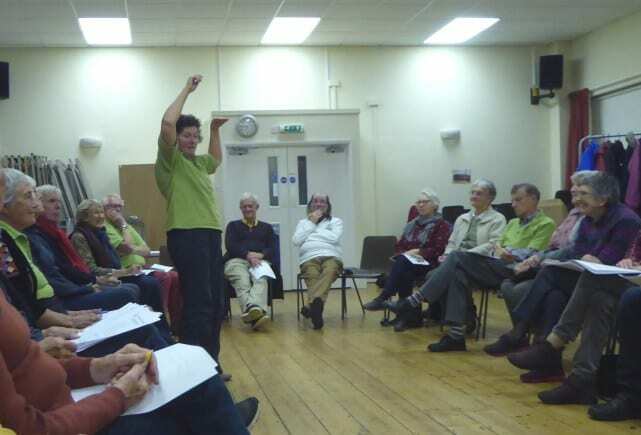 twice a month, regular committee meetings once a month, seasonal jobs involving cutting, raking, dragging, trimming, digging, bat and butterfly surveys, and so forth. 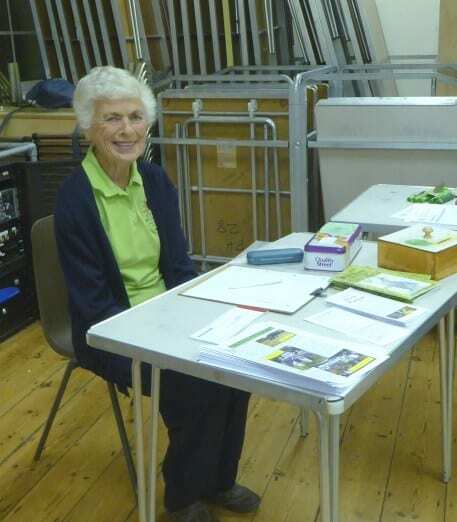 Volunteer numbers have been healthy, with anything between 6 and 12 turning up, which makes planning the jobs to be done each time quite difficult. However, with that variation, one can count on an average of ten and a half people each time, and its amazing what ten and a half motivated people can achieve in two hours! With the valuable addition of Colin to the leadership pool we have coped, and no session has been anything but valuable and useful. Having said that, we can always do with new leaders, and are always very pleased to welcome new volunteers. Brian’s faithful attendance at work days has ensured that we continue to pay due heed to what is coming up, flowering, appearing or reappearing each season, as well as providing photographic records of our ways of working, and who does what at work sessions. His enthusiasm for, and love of the Meadow, coupled with his immense knowledge, continue to inspire us all. On some occasions, a specially invited work force of volunteers has tackled jobs which are beyond the remit of the regular sessions, such as river clearance work near the south bridge in July under the direction of Maurice, and erection of 6 bat boxes in the minimum intervention area near the Lumley stream, also in July, under David Search. Last winter a fresh section of the Seagull Lane hedge was laid, under the direction of Rachel from TCV. Additionally we have employed a firm to clear river banks, a tree clearing firm in the Palmers Road copse, and an independent chain saw operator to do some tree work, as well as our favoured grass cutting specialist, Martin Cull, who did his usual splendid job of cutting parts of the Central and North Meadow to our specification. We used our own resources to pay for these last four jobs, mainly because we have not been satisfied with the standard of work done for HBC by their Norse operatives and their available machinery. So,with a mix of regular volunteers and some paid specialists, work on the Meadow has gone according to plan. Highlights of the year for me have been the hedge laying by our own team of volunteers, and the continuation of the development of active management in Palmers Road copse, a previously some what neglected area of the site. Our presence at the Emsworth Show at the end of August was another good time of sharing our aims with members of the general public and renewing acquaintance of old friends and supporters. 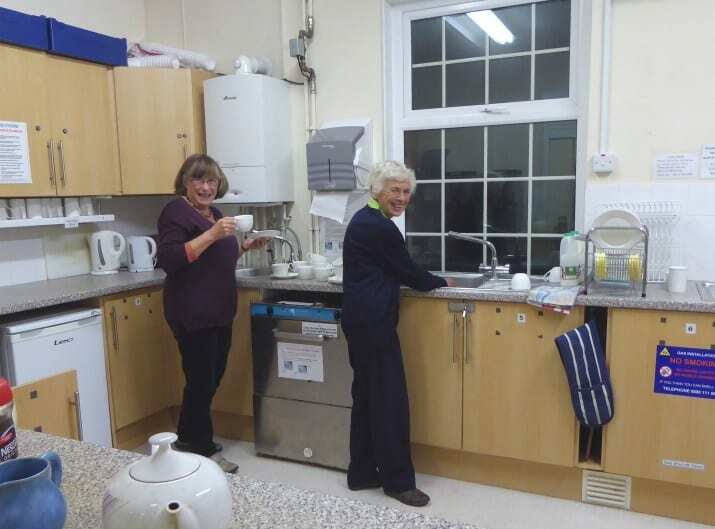 A particular encouragement was the gift of £500 by an original member, who can no longer volunteer for practical work but made his contribution in a very timely and useful way. I want also to make brief mention of our latest, and probably last, import of native British reptiles from local building development sites to us as a receptor site; we were approached earlier this year by another firm of ecologists who had heard of our good work in this area over the last 5 years. An initial survey in the summer proved that we still have room for more lizards and slowworms, the ones already on the meadow are evidently flourishing and breeding, so, once the financial settlement has been agreed with the developer Taylor Wimpey, more are due to be resettled with us, hopefully before the autumn is over. These relocations have proved a valuable source of income for us, but obviously it’s not a bottomless purse, and I suspect that this translocation will be our last. It has been gratifying to have approval of our management strategies from a range of knowledgeable and experienced ecologists, it’s good to know that we are doing things right! Another source of immense satisfaction for me has been the unstinting support of the Committee members in all that we have undertaken. New members like Roger have opened up new ways of thinking, and it has been a great pleasure to lead such a professional and enthusiastic group. 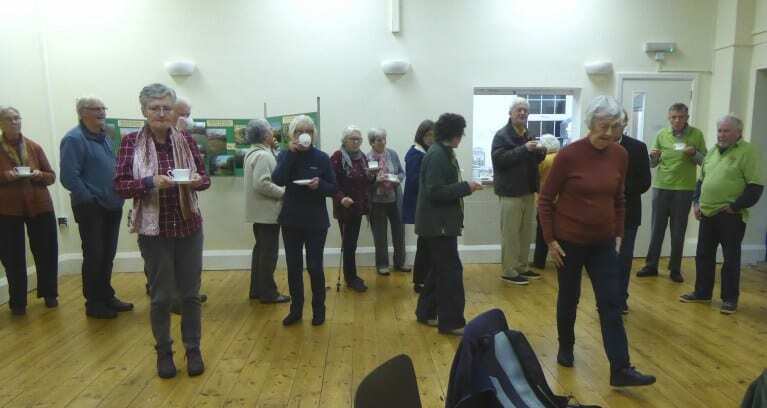 Later on this evening they will each have a chance to share with you part of their own motivation for being involved with the Brook Meadow Conservation effort. I also want to pay tribute to the enormous contribution made over the years by David Search, our own scientific specialist. 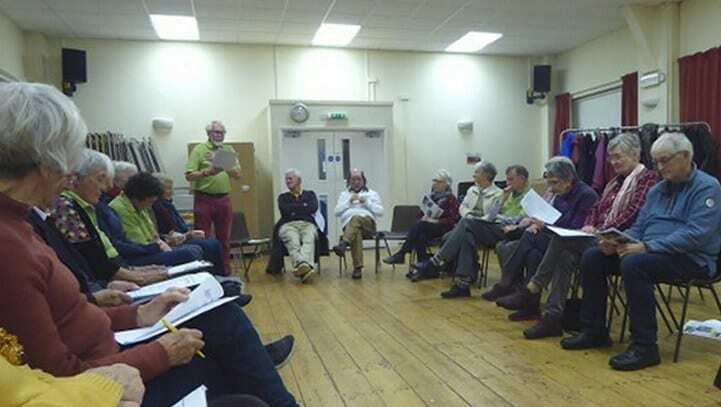 He is stepping down from regular committee attendance, since his work now takes him all over the country doing surveys, and he cannot always be at home on Hayling Island during the week, and weekends in Wales are very necessary for his sporting interests! David, we want to make you a life member of BMCG as a testament to the years of your close involvement, and whenever you are in reach, we hope you will continue with your invaluable surveys, and be sure there will always be a place for you as our ecological adviser on the second Monday of each month at our committee meeting when you can make it. Despite all this good news, some of the things that have happened this year must be regarded as disappointing though, and part of the reason for structuring this AGM differently from those of previous years is to confront the new challenges that we face. It is my hope that, in involving you the members in our planning for these contingencies, we can carry the group forward successfully. In general, I think our biggest challenge is that in these times of continuing austerity, the dwindling resources of local authorities and governmental organisations will reduce the amount of help we can expect from them towards our own particular aims and objectives. I would like to remind you of these, as laid out in our management plan: To protect and improve the diversity and habitats of grassland, woodland scrub and watercourses To increase the biodiversity of fauna and flora To protect and improve the habitats of endangered mammals To maintain and develop the attractiveness of the site for the quiet enjoyment of visitors, insofar as this is compatible with the other objectives. I have already referred to our problems with getting appropriate help from Norse who are now responsible for all outdoor areas of Havant Borough Council. We have found Norse to be, in general, less responsive to our requests, less efficient in the work they do carry out, and less likely to respond to the voice of our Councillors when we involve them in our requests; in parentheses, there is one job that they do regularly and to a high standard, trim the raised causeway paths when we request it, twice a year. But the days when we used to have regular bi-annual meetings with the responsible council officer to discuss what needed to be done by HBC are long gone. We cannot imagine that those days will ever return, nor do we imagine that Council spending on the meadow site will increase, indeed it is likely to be cut back further. Increasing our membership, and thus our income from fees: whereas four years ago we had a membership of around the 400 mark, it has now slipped to under 200, so a membership drive, and possible increase in subscriptions need to be considered. Raising the profile of the Meadow, making both residents and occasional visitors aware of this fantastic wildlife resource in the centre of the town. 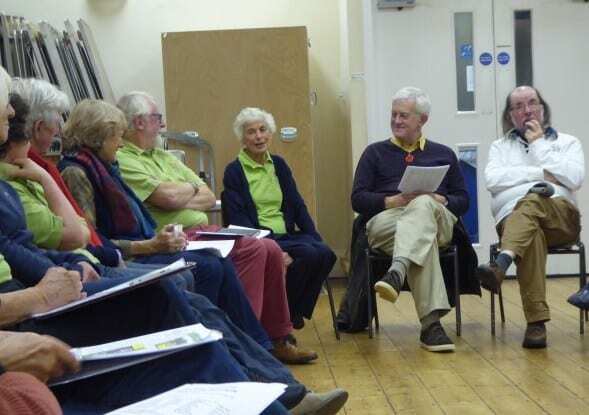 Exploring the ways of appealing to other bodies in the town for financial support, for example the Residents Association, the Community Association and others. Encouraging gifts from people who do not necessarily want to become active members, but wish to support our aims. Exploring ways of doing what we do on the meadow more economically, making better use of our volunteers and machinery. You get the idea. The second half of this meeting will be devoted to exploring your ideas and suggestions for how we go forward, to inform our committee deliberations in the coming year. We have already put together an outline of some steps we can take, and I have to say that some of these at least require new committee members, as we are already at full stretch with those we have now. So please give that some thought to see if you could join our close and hard working team. Thank you all very much for your interest and attention. Subscriptions continue to fall but thanks to generous donations and two legacy donations income has exceeded £3,000. At the year end the £700 instalment for relocation of reptiles was awaited but has been received since. Frank’s seat was installed this year, paid for by donations received last year. 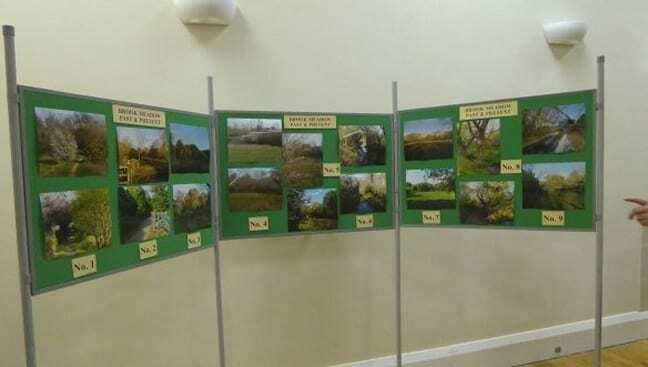 The annual cut of grass cost £696 and pollarding of trees in Palmers Road copse cost £600. River bank clearance by a contractor cost £580. These three tasks could not be undertaken by our volunteers. A new initiative was the installation of bat boxes at a cost of £308. Overall expenditure exceeded income by £183. 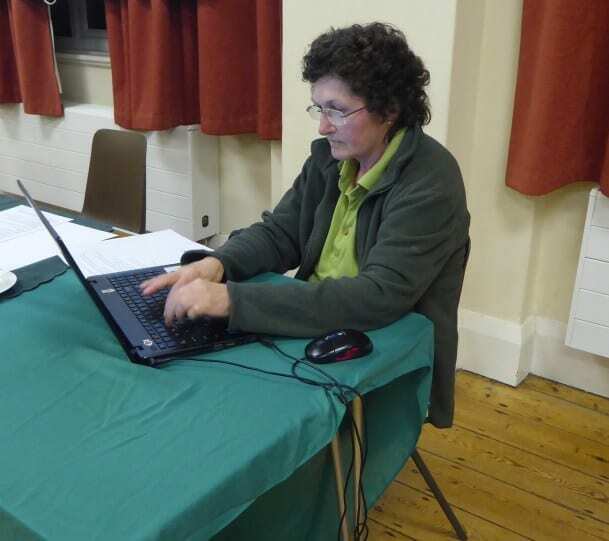 Our grateful thanks to Gill Coslett. Our auditor.